Meijer: Diaper Deals Starting Sunday 5/15 or Thursday 5/19! Meijer: P&G Deal's Starting Sunday 5/15 or Thursday 5/19! Meijer: Unilever Deals Starting Sunday 5/15 or Thursday 5/19! Meijer: PowerBar quadruple stack valid 5/16-5/22! 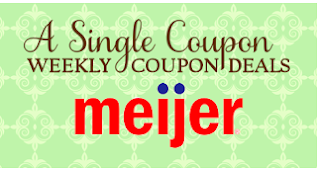 Meijer: Items included in the buy $30 get $10 instantly sale! Meijer: Unadvertised Item's part of the buy 5, save $5 sale! Meijer: FREE Glad Cling Wrap!